Tessellation for block printing – really good fun! 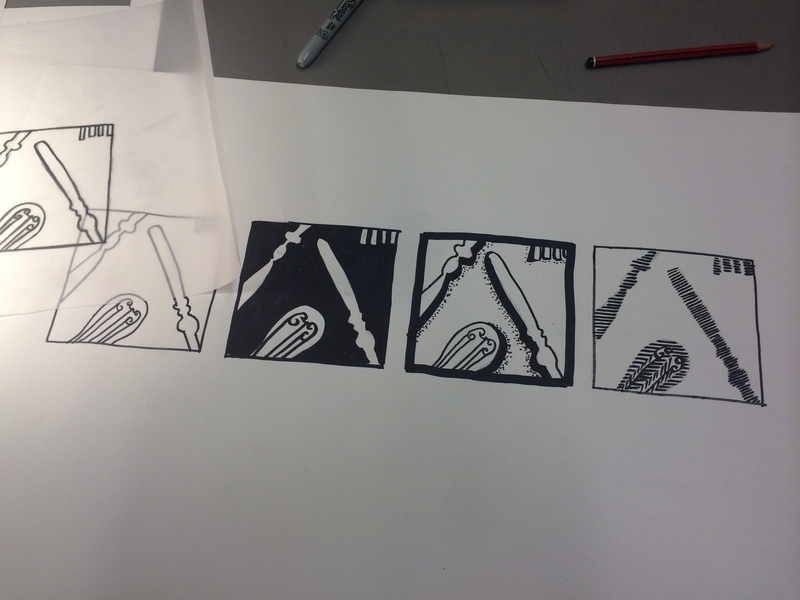 In my printing class we started our tessellation project – what fun! Tessellation is when you fit a regular shape to itself many times, covering the space, like a tiled surface. When printing, creating tiles or doing patchwork and quilting this is a most intriguing feature of shapes. There are only three regular tessellations – squares, rectangles and hexagons. This project was really fun and if you have access to a photocopier this would be a brilliant project to do with children. I think it would be nice using a piece of A-4 paper with a simple design on it, as you could create a significantly large pattern – perhaps enough to paper a wall – very quickly. 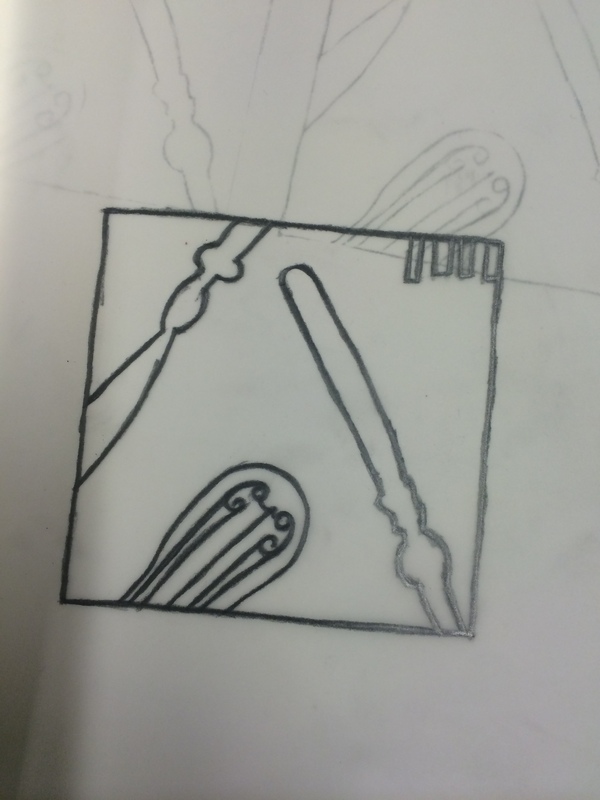 Anyway this term we are designing a pattern that we will use for block printing. 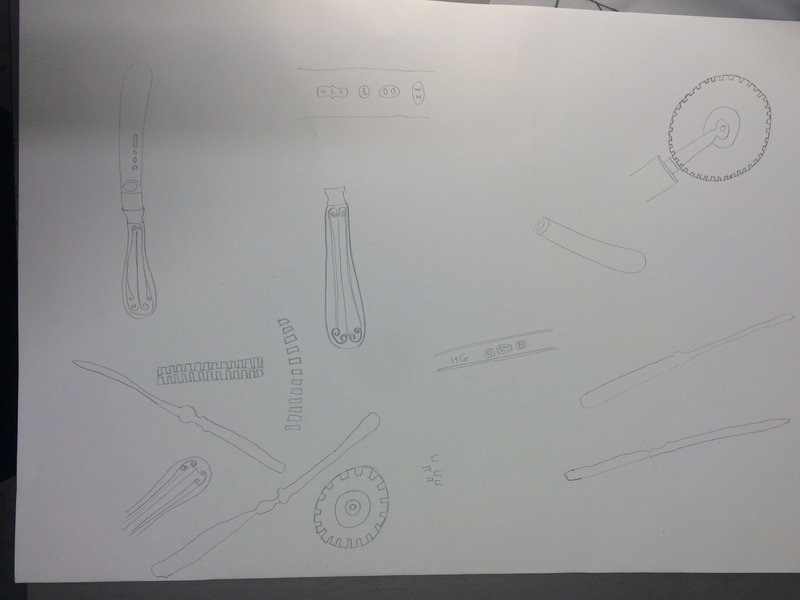 The exercise started with drawing a kitchen implement or two on a large sheet of paper. I took in a small butter knife from Nick’s Grandma, and his ravioli cutter. One old and shapely, with a curved end and decorated handle, and hall marks. The other modern and steely, with a crenellated edge. We drew our objects, traced them, lit them with a lamp and traced their shadows, until we had a nice selection of shapes. Next we cut out one of the regular shapes mentioned above from a piece of card. I took the square. I love squares. Using the window this created we moved it over our drawing until we got an interesting view of our drawings. This was then traced, and we rubbed graphite pencil on the back of the drawing so we could reproduce it three or four times. Once these had been copied out in pencil we used black felt tip pens to create different versions of the design. I liked the third option the best where I had created a kind of shadow around my knife and crenelations using a wide felt tip and a series of dots. This picture was then photocopied as it was, and reversed. We then laid out our shapes in a pleasing fashion. As you can see it is easy to create a very cool, and rather unexpected effect. You can imagine these as floor tiles, wall paper or fabric patterns. Which is what they will become. Next week we will turn the designs into block prints and print textiles with them. If you want to amuse yourself with making patterns try this lovely little programme. Who would have thought one could make such lovely patterns from such simple kitchen tools. Lovely. Takes me way back to the art room and my teaching days. Love your design and looking forward to seeing your printed fabric. Now, just need a 10m table printing table! I LOVE it. what an exciting way to print. Kitchen utensil to bespoke fashion design. Just great. Oooh, that looks really interesting Kate. Whodathunk you could turn kitchen implements into a kaleidoscope?! I’m just catching up on missed posts, this is so fascinating with great results! I really enjoy seeing your surface design experiments!